Giles Goodland is a poet who is always pushing the boundaries what language can be made to do and his new collection has the ostensible subject of ‘insects and other small creatures’ as its banner heading. The striking cover illustration is composed of twenty six beetles with two variants of ‘jewel beetle’ juxtaposed in 4 neat lines. Although each poem title is the name of a specific creature the poems themselves are as generated by linguistic word play, loose association and deliberately frustrated narratives as they are by biological research and personal observation. These are not your standard ‘poems about things’, nor are they directly related to any pastoral or romantic traditions dealing with the natural world, though there are literary allusions and suggestions, often disguised by homophone clusters and interrupted by intentionally ‘awkward’ moments aimed at halting or slowing down the flow. Neologisms abound, often of a humorous nature and Goodland’s day job as a lexicographer at OUP clearly feeds into his playful yet serious poetry. His creative juices are matched by an intellectual curiousness and a sense of fun although humour is not a facet much commented on his work, which I find surprising. ‘Wasps’ begins in a more-or-less straightforward narrative sense – ‘For days I have watched them / in their roadmender jackets…’, shifts into wordplay mode – ‘For ages it suffered forage-rage. / Forages it suffered for age-rage.’ – and includes a self-referential commentary on the relation between writing and ‘the world out there’, with ‘When they find the cure / for poetry, it will be 7 parts wasp.’ He frequently runs words together a la E.E. Cummings from ages ago and also subtly changes words by moving or adding/deleting a letter which causes the reader to pause, stumble or rethink what they’ve just read. Despite this ‘stumbling block’ I’ve found it best to follow my nose when approaching these poems and read an individual piece ‘at a lick’ before slowly re-reading in a more considered manner. There are many varieties of quick-witted wordplay and Stanley Unwin type ‘confused’ linguistic punning, occasionally to excess even in a single word, for example, as in the following sentence – ‘Presisting the intelligence is / furtile when the clouds are falling in’ – where ‘furtile’ seems to combine ‘furtive’, ‘fertile’ and ‘futile’. Nonsense poetry has certainly been a feature of the British tradition, with Edward Lear and Lewis Carroll as ‘prefigures’ of Surrealism, it could be argued and Goodland is clearly in tune with this aspect though his use of rhyme is subtle and usually within the body of the text rather than at the line end. to read aloud, even If only to yourself! The ‘mountain of faulty mirrors’ suggests a language pulled apart, twisted and alienated to the point of it being a ‘world that contains not-me’. I doubt that everyone will appreciate this impressive achievement but it’s a great book to dip into, enjoy, laugh aloud at, scrunch up your face in incomprehension to (or should that be ‘discomprehension?,) and generally have a good time. 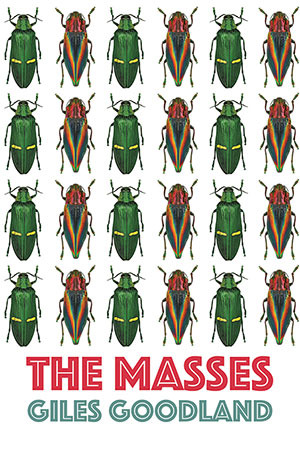 The Masses is a seriously entertaining book which also has a serious side and which demonstrates that a literary obsession can be a good thing. I hope you have as good a time reading it as I am.